Siltation studies of 27 dam-created reservoirs spanning the nation, obtained using the RTI law indicate that all is not well. Storage capacities of the reservoirs have been dropping and the loss is alarming; what's worse, little is being to done to stop the wastage, find Himanshu Thakkar & Swarup Bhattacharyya. India has around 4500 large reservoirs and lakhs of smaller reservoirs. Government documents received through a Right to Information application recently indicate that an alarming proportion of the storage capacities of these reservoirs have been lost due to negligence, amounting to massive wastage of public funds using to construct the projects. Furthermore, it appears that little is being done about it, even as planning goes on. Reservoirs, created by dams on rivers, get silt through river waters; a significant proportion of the silt settles down in the reservoir, thus reducing the space available for storage of water. Most parts of India being dependent for water on the 3-4 month long monsoon. Reservoirs are created to store water for use in non monsoon months. The reservoirs, created by dams on rivers, also get silt through river waters; a significant proportion of the silt settles down in the reservoir itself, thus reducing the space available for storage of water. 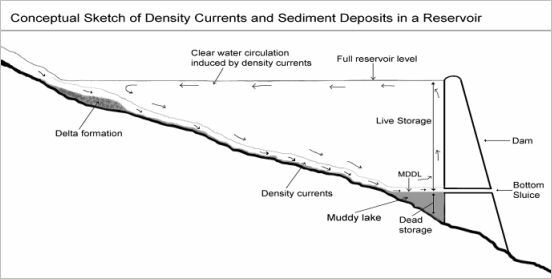 Studies over the years have shown that the silt gets deposited in both the dead storage (the storage at the bottom, below the Minimum Draw Down Level, which is not used under normal circumstances) and in the live storage (LS). (See figure below). This process of accumulation of silt in the reservoirs is called siltation. Siltation reduces benefits from dams constructed at huge costs to the nation. Siltation of reservoirs can also have a number of other impacts, including increased evaporation losses, increased backwater flooding and also could damage the power house turbines. Dams are uniquely different from engineering infrastructure such as roads, harbors, and cities, and which can be reconstructed on the same site occupied by obsolete infrastructure." He pointed out that dams cannot be reconstructed at the same site once the reservoir has filled with sediment, and that the sediment must either be removed or the site abandoned. "The cost of sediment removal at a large reservoir can easily exceed the original dam construction cost by an order of magnitude," Morris wrote. Periodical capacity surveys of reservoirs help in assessing the rate of siltation and reduction in storage capacity. This information is necessary for efficient management of the reservoir. Periodical surveys are also necessary to arrive at a realistic siltation index for planning of future reservoir projects in the basin. Using the Right to Information Act, we recently obtained siltation studies of 27 reservoirs in India from the Central Water Commission (CWC), the technical arm of the Government of India's Ministry of Water Resources. These studies were done through Satellite Remote Sensing (SRS) technology, but they also give information about the findings of previous siltation studies for the respective reservoir done through the more traditional hydrographic method. Some of the major findings from these studies are given below. For the 23 of the 27 reservoirs the annual loss in live storage capacity is 214.2 MCM, that is 0.912 per cent (or nearly 1 per cent per year) of the original live storage capacity. These 23 reservoirs have already lost 23.11 per cent of LS by 2006. 13 of these reservoirs have already lost 20 per cent or more of their capacities. (A cubic meter is 1000 litres. A million cubic meters is 100 crore litres and a billion cubic meters is 100,000 crore litres. The annual loss figure arrived at by the Govt of India's National Commission for Integrated Water Resources Development is 1.3 BCM. This may prove to be an underestimate. Considering that we now have about 214 BCM of live storage capacity through large reservoirs and if we apply the same loss rate (since the reservoirs in this sample are well distributed geographically and represent both small and large and also low and high siltation rate reservoirs, we may not be too much off the mark), we are losing about 1.95 BCM capacity annually. This should alarm everyone, for what this means is that firstly, we have already lost about a quarter of the live storage capacities of just the 23 reservoirs, due to siltation. The proportion of capacity lost from reservoirs all over India could easily be of a similar order of magnitude. In turn, this implies a significant reduction in benefits from the reservoirs in terms of hydropower generation, irrigation, water supply and flood management. Also, in economic terms, creation of 1.95 BCM of capacity would at today's costs would require at least Rs.2017 crores. This means that we are daily losing reservoir capacity worth Rs.5.53 crores. Even if we go by the 1.3 BCM estimate of annual storage capacity loss, that should be alarming enough for everyone, because each day we are losing Rs.4 crores worth of storage capacity through siltation. While it is not possible to totally avoid or stop siltation, one way to reduce the siltation of the reservoirs is to do Catchment Area Treatment (CAT). CAT applies various techniques like plantation, gully plugging, check dams, etc., in the degraded portions of the catchments to reduce the silt coming into the reservoirs. CAT plans are expected to be implemented before the project construction is over so that there is minimum siltation of the reservoirs once water storage in the reservoir is started. However here too the situation is alarming. Till almost mid-1980s, most River Valley projects did not have a CAT component! The Bhakra dam did have a CAT component, but even here, according to the Comptroller and Auditor General, there was no way to ascertain if any CAT had really been done on the ground, while the money allocated for the CAT was all spent. The CAG had indirectly hinted that nothing was really done. Even in the cases of projects taken up after mid-1980s, while the provision of CAT exists on paper, it largely remains just there, on paper. Most recently, CAT plans are yet to be implemented for the World Bank funded 1500 MW Nathpa Jhakri Hydropower Project and the Jaiprakash Group's 300 MW Baspa project, both in Himachal Pradesh. Both projects were commissioned in 2003. The Nathpa Jhakri project is already facing serious problems; the project had to be stopped due to high silt in the river for 25 days since April 2006 alone. That siltation is a serious issue and has warranted action to arrest the destruction of productive reservoir capacity created at huge costs has been known for many years. Planners have acknowledged this. The Mid Term Appraisal of the 9th Five Year Plan had also warned (Oct 2000, p 76), "there is an urgent need to review the status of reservoir sedimentation." However, most such warnings have gone unheeded. Catchment area treatment that can help reduce the siltation, has largely remained non existent, except on paper. Not surprisingly, the SRS studies reveal some of the heavily silted reservoirs of India. The Matatila reservoir (Betwa river, UP) lost 38 per cent of gross capacity between 1956 and 1998-9. The dead storage up to the original Minimum Draw Down Level (MDDL) of 295.66 metres is completely filled with silt. Even further level upto 296.15 metres is now completely filled with silt. Total capacity loss by 1999 itself was 430.47 MCM (million cubic meters). Other reservoirs are in similar state. Gumti (Gumti river, Tripura) has lost 63.83 MCM, that is 20.4 per cent of its live storage capacity in 19 years. Maithon (Damodar river, Jharkhand) has lost 25.29 per cent of its live storage capacity silted up in 46 years. Kadana (Mahi river, Gujarat) has lost 12.85 per cent (278.6 MCM) in 11 years. Srisailam (Krishna river, AP) has lost 2013.33 MCM or 28.096 per cent in 15 years. Acknowledging that the live storage capacity of the reservoirs was getting reduced due to siltation, the Remote Sensing Directorate headquartered in Hyderabad, has stated that since 1958, when it was established, a systematic effort has been made by various departments/ organisations to evaluate the capacity of reservoirs. But the SRS studies under review shows how that this claim is unjustified. Only in Matatila and Maithon reservoir, more than five surveys have been done. In case of Palitana three surveys have been done. Three reservoirs have been reassessed twice and six reservoirs only once. 15 reservoirs have been assessed for the first time through remote sensing survey only recently. The Ramsagar, Krishnarajasagar, Lower Bhawani, Dudhawa, Umiam - all these old reservoirs have been assessed for the first time, as stated in the studies. Ramsagar reservoir in Rajasthan constructed in 1905 was reassessed for the first time in 2003! In other words, the project authorities submerged an additional 6118 hectares of land. What happened to the people in this submergence zone is not known. The SRS study makes a shocking admission for these gross errors, "The results of Jakham reservoir were discussed with many officials of the irrigation department. They were of the opinion that there might be some error in conversion of area values from one unit to another." Can one entrust planning, construction and operation of large dams in the hands of officials who can present such excuse for the gross errors in reservoir designs? Will there be any consequences for these blunders? Furthermore, for number of other reservoirs  Matatila, Idukki, Isapur, Machhkund, Rana Pratap Sagar, and Sriailam  the original surveys are either inadequate or wrong, and yet planning has proceeded. So poor is the quality of work that even simple aspects like accurate recording when impoundment was done, or whether a project has a hydropower component or not have not been taken care. The Kadana SRS study says the reservoir was impounded in 1983, when in reality the impoundment happened in 1977. The Damanganga report says the project installed hydropower capacity is 1000 MW, when that project is not known to have any hydropower component! The report of Sondur Reservoir siltation says that an accompanying graph is for the Umiam reservoir! The report of the Krishnaraj Sagar Reservoir's SRS study says that the live storage of Lower Bhawani reservoir is 1215.94 MCM, instead of referring to the KRS reservoir. The report on Kadana reservoir ends with salient features of Mahi Bajaj Sagar (and a preface for MBS) in place of salient features of Kadana! The quality of SRS survey reports also leave a lot to be desired. The reports from CWC are worse compared with those from the Regional Remote Sensing Service Centre (RRSSC), Jodhpur. In most cases, the actual rate of siltation is found to be higher than the design rate. India's reservoir capacities have been created at the cost of thousands of crores of rupees and we continue to spend huge sums each year for creating additional storage capacities. Enormous social and environmental costs have also been paid in the creation of these capacities. However, we are doing practically nothing to stop the destruction of the capacities created with such massive investments. As per our current analysis noted earlier in this article, we are losing at least 1.95 BCM storage capacity through siltation every year, valued at about Rs.2017 crores at replacement costs. The losses are alarming and the consequences far reaching. And yet the blind and reckless pursuit of more of the same continues. The power generation from the upgraded 15 MW installed capacity at the Gumti Dam in Tripura is so low that even the World Bank strategy paper for the North East (dated June 28, 2006) recommends exploration of decommissioning of the dam. In the meantime, by the time you wake up tomorrow morning, we would have lost storage capacity worth Rs.5.53 crores, and by all accounts, we are doing nothing to stop this. Himanshu Thakkar and Swarup Bhattacharyya are with the Delhi-based South Asia Network on Dams, Rivers and People.